In 12-inch skillet, heat olive oil over medium-high heat. Add onions, carrots, celery, salt and Italian seasoning. Cook 12 to 15 minutes, stirring frequently, until vegetables soften and begin to brown. Add garlic; cook 30 seconds. Stir in tomatoes, vinegar and sugar; cook 4 to 6 minutes or until liquid evaporates. In 4-quart saucepan, place broth; stir in tomato mixture. Heat to simmering over high heat. Reduce heat to medium-low; cook 5 minutes to combine flavors. Top with basil and Parmesan cheese. To freeze: Follow directions in Step 1. Remove from heat; cool 10 minutes. Transfer to two 1-quart resealable freezer plastic bags; freeze up to 3 months. When ready to serve: In 4-quart saucepan, add broth and contents of both bags of frozen tomato mixture. Heat to simmering over high heat. Reduce heat to medium-low; cook 8 to 12 minutes, breaking up frozen mixture with spatula, until mixture thaws and begins to simmer. Cook 5 minutes longer to combine flavors. Top with basil and Parmesan cheese. 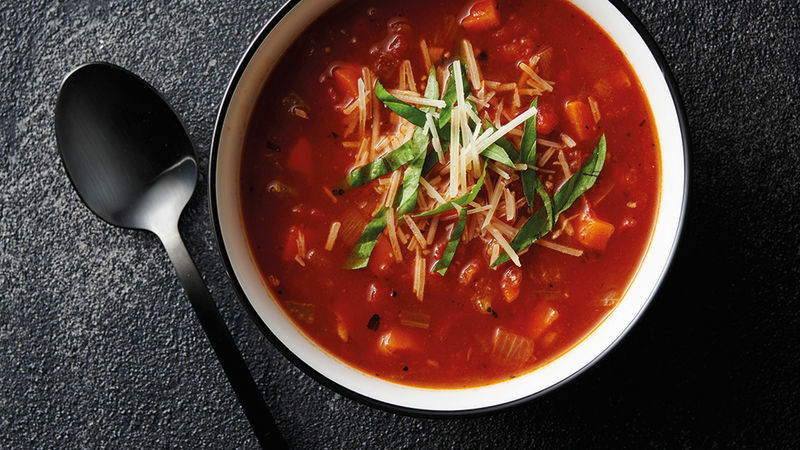 For even more fresh flavor, top the finished soup with more fresh Italian herbs – flat-leaf parsley, marjoram, oregano or thyme leaves. Soffritto is the foundation of many classic Italian soups and sauces. It consists of sautéed onion, celery, carrot and spices.